Scroll to the bottom of the page and see our new "family" member ! 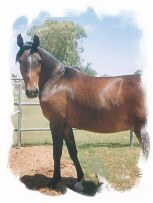 She is 3/4 Arabian and 1/4 Quarter horse and I have had her since she was 5 1/2 years old. In this other picture she is modeling a friend's hat! I believe Virginia's daughter, Sarah, was having her model it after a ride a few years ago. 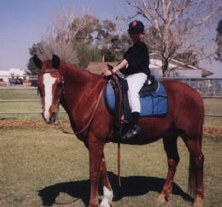 Baskadin (Kadi) was my first horse. 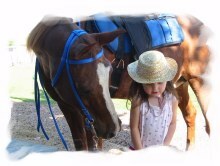 She is the horse we use when a novice rider visits and wants to go for a ride. 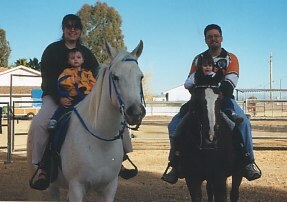 and Virginia's son, Keith, having just arrived from Canada wanted to have a real western ride! 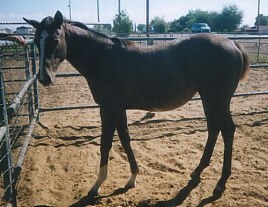 Kadi has had three foals since I have had her -- this is "Precious" and she was her last one. 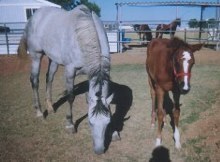 Kadi was 17 years old at the time -- just proves that older mares can have foals. 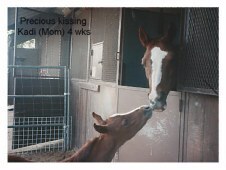 Visit Our Foals page for more baby pictures. Marin, might have in the way of a treat after giving her a ride! 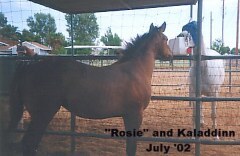 On Tuesday July 27, 2004 we sadly had to put Kadi, at age 26, down after many attempts to make her comfortable. She was generally hurting and found walking and getting up and down very painful. It was a hard decision, but the best for Kadi, and after watching her, there was no doubt that this was the time. Good-bye, Kadi. Here Kaladdinn is waiting his turn to show himself off in the new Arabian Sport Horse class (2 years and under) in December 1999. He placed 2nd in this class, thrilling us all! He has just been started under saddle and is quickly catching onto what we are asking of him, although he feels that working in the round pen is ho-hum b-o-r-i-n-g! 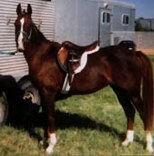 We feel that he has the potential to excel in dressage, as a show hunter, western or even endurance. (Kandi). 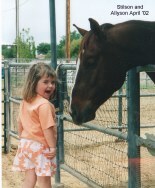 She was born at the Rockin D Ranch on Jan 2, 1995 and has had a wonderful home for the past 6 1/2 years. Her previous owners decided that she needed to come back "home" when their home situation changed. Welcome Kandi! You are as sweet as you always were! 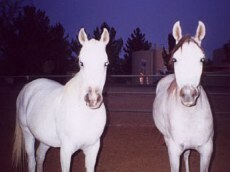 Guess who is Kandi's mom -- that's right -- ZA Star Zapphire (TAFFY) on the left side of the above photo and shown below. Mary, owner of the Rockin' D Ranch can't figure out how she went from owning 2 horses before October/November and suddenly now has 4! 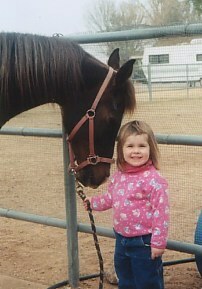 She is very happy to have both of these horses "home" again. bond there and they do belong to each other. I am not sure Taffy was very happy to see her daughter, Bolds Karmel Kandi (Kandi), return "home" -- see photo to the left. 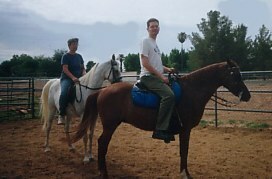 May 2001: Taffy and her owner are back in Arizona for the summer - YEAHHHH!! Taffy is again back in Pennsylvania!! 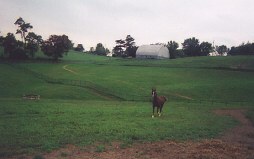 She is staying at Coventry Equestrian Center in Washington, PA. Email:blythdal@stargate.net (Kristin Hermann). This picture was taken on her first day -- she doesn't look too unhappy does she? And why would she be -- look at all that pasture! She arrived early in September after a week's travel, this time going through Dallas. At least this time, the truck didn't break down like they did on her last two trips. She is racking up so many "trailer miles" that she is going to put in for a discount for her next trip! She is enjoying the large green pastures, creeks, trees, and lessons and has even found that many of her former PA barn mates have arrived at Coventry also. January 22, 2002 Taffy arrived from PA -- WELCOME BACK TAFFY!!!! Mom and Dad with son, Keith, will be arriving back in AZ on August 4 -- Taffy is so excited and can't wait to get back to work -- she hears Virginia (Mom) has been learning all kinds of new things to show to her and her friends, Kalamity and Kaladdinn -- get ready guys, vacation time is over!!! Taffy has met a new friend in Arizona -- Allyson and her Mom, Kelly. 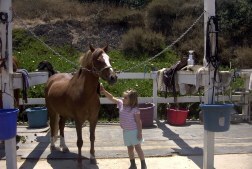 They have their own horse, Dewey, but enjoy spending time with Taffy. 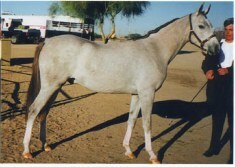 Pintura Magica -- She is a five year old Paso Fino mare from California. Magica has a very sweet and loving personality and will be Barb's special riding horse now that Kisha has passed on to those greener pastures. 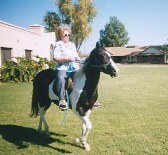 Here is Magica at her home in CA and being ridden by Barb at the Rockin' "D" .... what a beauty! She has completed 10 months of training with Debbie Barcon who owned Magica's sire, RAINFOREST BRIBONZUELO. KRM Grand Finale "Cole" is a 4 year old black bay Morgan who is 16'2 hh already and still growing! 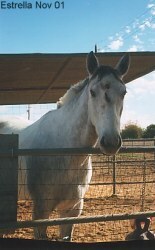 He came from Texas in May 2003, where he was in training, and is enjoying "just being a horse" for awhile. 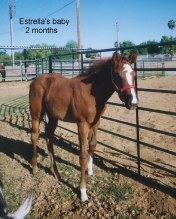 He and his human "mom" join the family of Estrella Rock and Izzy's Cat below. As you can see he is another ball player! He is a real sweetheart it looks like he and Kaladdinn will be best buddies. "He is a total lovebug". 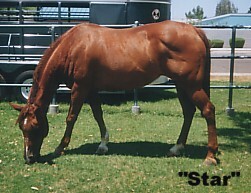 This is "Star", a 21 year old Quarter Horse mare that will be making her new home with Stilson in CA. They are currently staying at the Rockin' "D" Ranch and will leave on July 21, 2002 to join Kelly and family in their new home. From what I hear, they are going to love it there -- cool, no mosquitoes, and a great view! Look what Allyson got for her 5th birthday. A pony name "Murphy"! 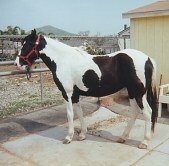 He is a 12 hand Welsh pony. 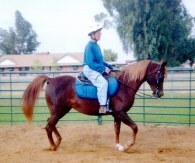 He is 8 years old and will be Allyson's pony to take care of and show when she is ready to start. He was a lesson pony, but all of the trainer's students have outgrown him so now he will come live with us! 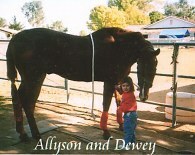 This is "Elliott" and he is a 12 year old Thoroughbred gelding that was "rescued" by Kelly. 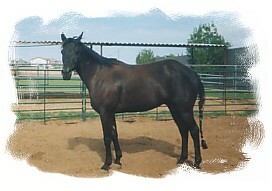 He is 16.3 and will have a "forever home" with the gang of the Hilltop Ranch. 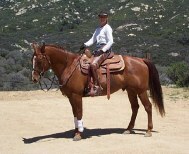 Kelly said, "He is the TB I have always dreamed of owning and he is a 'Gentle Giant'. " This is "Oliver" who has also joined the Hilltop Ranch gang. He is an Appendix gelding and according to Kelly, he is such a baby. So sweet and will stop eating just in case there is a chance he could get some human hugs! This is "Little Peppy Bon" (Flip Wilson). 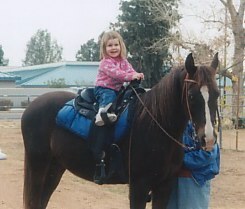 Flip came to our ranch in October 2001 and he and his owner, Sarah, like to do "barrels" and go trail riding. He has the great bloodlines of Doc Bar and Peppy San Badger and is a real "looker" -- this picture doesn't do him justice. 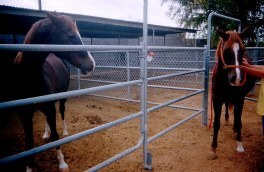 To the left is "Rosey Middle", a 10 year old TB mare who is 16.2 hands. She joined our crew the first of June 2002. Rosey left in November to go back to jumping -- Good luck Rosey! We miss you! Welcome "Stardust Cody" a dark palomino Morgan gelding who is 7 years old. He traveled all the way from Lyons, New York in November 2002 to enjoy our Arizona weather. I don't think he misses all that snow! UPDATE: Cody is now at a stable that offers a large arena and a much larger stall. Horsein' Around Inc. for taking such good care of our special friend! these pictures. The longer she is with me the more grey hairs she gets! 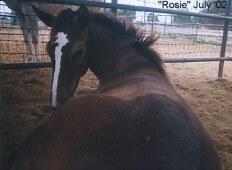 Since we had another "Rosey" at the ranch, I gave her a new barn name of "Rosella" which is closer to Mom's name of Estrella -- it is also an old family name on my father's side. I understand that part of her registered will be "Izzy" (Isabel) after her owner's mother. "Rosella" has a new registered name: "Izzy's Cat"
This is "Estrella Rock", a 6 year old Thoroughbred mare, who joined us at the end of November 2001. She is going to be a first time "Mom" at the end of February/beginning of March and will be leaving shortly for CA to have her foal. She will be coming back in a few months with her youngster -- we can't wait to have a baby around again! rose in a vase. She is very sweet! This is "Rosella" now at 4 months -- her blaze is looking more like a "bird"? a "sea horse"? She is really getting big as you can see and she has quite a bit more grey hairs, but will she really turn grey? Will she be a roan? 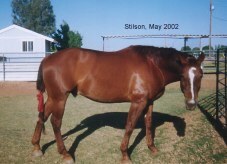 Below is a picture taken in October 2002 -- she is really growing!